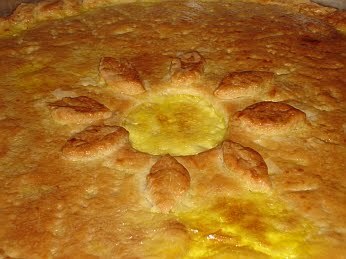 In the new forum on this blog (see link at top of page) someone asked for a recipe for kreatopita (meat pie). There are several recipes, but the one given is here is speciality from Ioannina, which is in the north west of Greece. Lovely and nutritious! Enough soft flour to make a pliable but non-sticky dough. Slice the onions and place them in a colander. Pour salted boiled water over them, rinse and drain well. Melt the 2 tbsp butter in a pan, add the onions and gently fry for 2 minutes. Add the mincemeat, cinnamon, salt and pepper and stir well. Add 100 ml of water and let it boil until just the mixture is left. Transfer the mixture to a mixing bowl and let it cool. 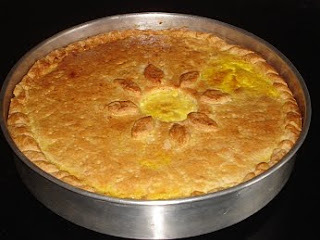 Add the 3 eggs, cheese, rusks and béchamel sauce and set aside while you prepare the pastry. Combine all the pastry ingredients in a mixing bowl, except for the egg yolk/milk mixture which is for the finishing. Knead it well into a pliable but non-sticky dough. Separate the dough into 2 balls, with the one being slightly larger than the other. Take the larger ball and roll it out on a floured working surface – enough to more than cover your oven dish. Place it in a buttered oven dish, covering the bottom, sides and going slightly over the edge at the top. Now place the filling mixture on top of the pastry in the oven dish and level it. Roll out the second (smaller) dough ball and cover the filling. Butter the edge of the first pastry and fold it over inwards to cover the edge of the second pastry and make a nice border, pressing around the edge with your fingertips. Brush the surface with the egg yolk/milk mixture. Make a hole in the centre to allow the steam to escape and prick the rest of the pastry with a fork. You can make some leaves with the dough and place them around the central hole for decoration. Place in a preheated oven at 180 degrees Celsius for approx. 45 minutes until it has turned a nice golden brown. one of my favorite recipes! it's delicious!